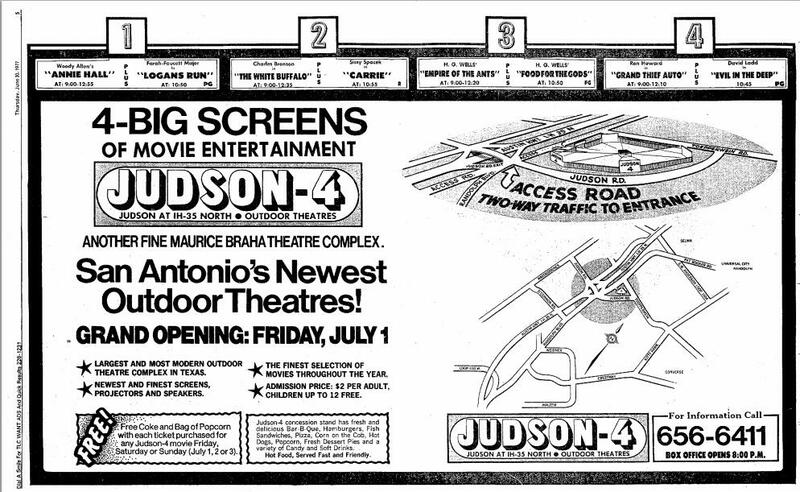 The original Majestic Theater holds its grand opening. 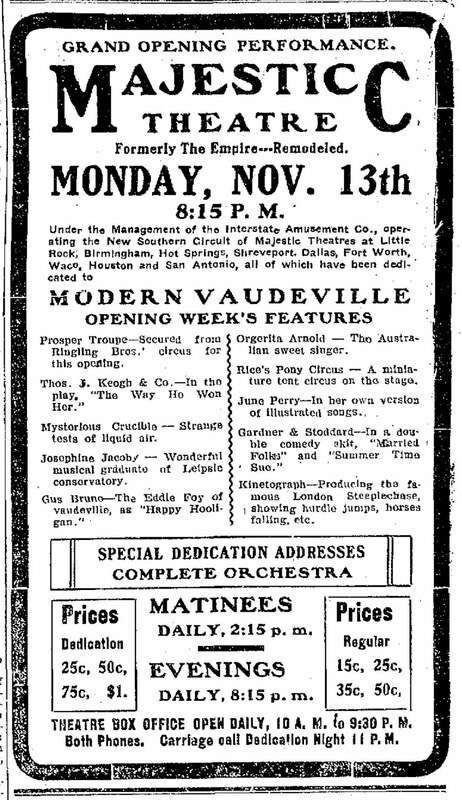 It will be renamed the State Theater in 1929 when the current Majestic Theater opens. In one of the most sensational crimes in San Antonio history, Otto Koehler, the president and manager of the San Antonio Brewing Association, was murdered by his mistress, Emma Burgemeister. A massive explosion at Medina Air Base shatters windows throughout San Antonio and is felt as far as Castroville, 17 miles away. 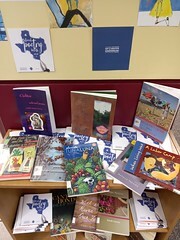 Public library, have books, will lend. But that's just the tip of the iceberg. Come visit us and find out all the exciting things we have to offer. Posted on November 13, 2010, in Texana and tagged 1905, 1914, 1963, Koehler, Majestic, Medina Base Explosion. Bookmark the permalink. 5 Comments. >I was fairly close to the blast that occured on 13 Nov 1963 at the AEC facility at Medina Base. Below is my account of what I witnessed. Sincerely,Gerald H. TonnellLt Colonel, USAF (Retired)TESTIMONY by Gerald H. Tonnell, Captain, USAF (in 1963):I was a flight commander on duty in my Officer Training School (OTS) office on Medina Base (Lackland AFB Annex) very near where the explosion occurred on November 13, 1963. I would guess my office, which was on the east side of our north/south oriented building, was about a third of a mile or so from the storage igloo that blew up. I was conducting the initial interview on a new officer trainee at the time of the explosion. My office chair was on wheels and when the blast came, it rolled my chair backward (east) several inches. The officer trainee facing me was thrown forward out of his chair. He was bewildered, and, not knowing exactly what happened, all I could muster in the way of an explanation was that some flight jockey must have broken the sound barrier in his fighter right over the school. I could look through my open door and into the offices across the hall (to the west) and see out the windows in the direction of the explosion. As I recall, some of those windows were broken – this was unusual because our office windows were fairly thick, having been reinforced with something akin to chicken wire which had been sandwiched in-between the layers of glass. There were some glass shards stuck in the back of a few, thankfully empty, office chairs – there was also a lot of glass on the floor. All of the Flight Commanders on that side (west) of the building were out of their offices and either on the drill pad or the sports fields with their officer trainees. (One of my fellow flight commanders, who was on one of our sports fields, later said that the concussion knocked some of the people off of their feet. )A few moments after the blast, I excused myself and rushed across the hall and looked west out the windows. I could only see what appeared to be a solid light overcast left to right out of the window. On the other hand, when I turned and looked out my window on the east side of the building, I could see a partly cloudy sky with plenty of blue. Later, I read that the blast took the rough form of an atomic mushroom. I could not see a distinct blast cloud because I was too close to the explosion. 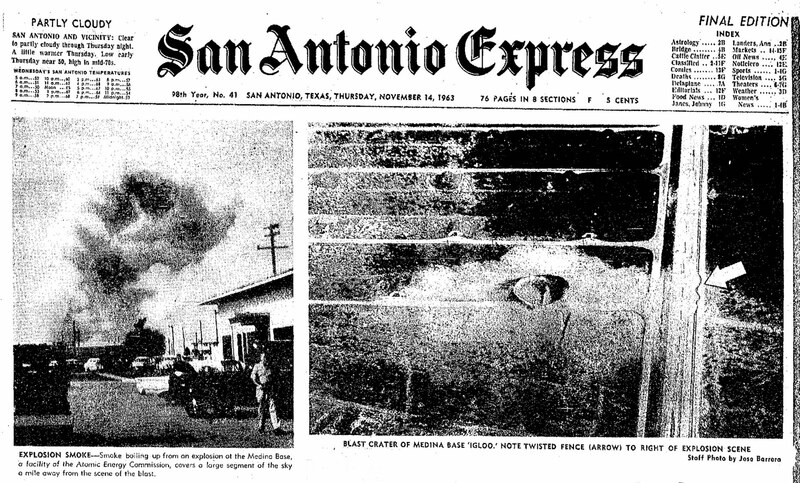 The next day in the San Antonio Express newspaper, it was reported that some windows were broken downtown and in neighboring communities – some 15 or more miles from the blast. Scuttlebutt in the office was that Randolph AFB even had some light damage. I guess our building didn’t suffer more damage because we were so close — the blast went more or less straight up because the shape of the igloo in which the explosives were stored forced the concussion to go in that direction. I do not believe any of the 600 or so faculty, staff or students at OTS on the Medina facility were injured. But all of us were surprised to say the least.All in all, it was an interesting day. Regarding the explosion that occurred on Medina Base on November 13th, 1963. My Name is Donald R. Barnes, at the time of the blast I was on Duty as a Lt. of security. My crew went to work at 7 am on that day. I remember the explosion very vividly as I was sitting at my desk in the security control room inside the compound when the blast occurred. The building shook and the blast was very loud. I ran out side and saw a huge cloud of dust and smoke rising to the sky west of my position. The security force went into their emergency actions & the main entrance gate was closed. I jumped into the Ambulance that was parked along with the patrol vehicles and headed towards the blast area. The dirt had covered up quite a bit of the access roads but I was able to recover the three men who had been working at the igloo in question..miraculous none of the men had received any serious injuries. After picking up the three men I was directed to proceed to the Nix Hospital in downtown San Antonio. Escorts and we headed to the Nix hospital . Much confusion surrounded the blast, some thinking it was a nuclear explosion and the information regarding the blast hit the airwaves and appeared to travel all over the US in a matter of minutes. It was reported that city evacuations were underway. any radiation of any substance involved in the blast. waiting to be destroyed by a controlled burning process. This explosion was the largest accidental explosion that had ever occurred in the US at that time and to my knowledge it still holds the record. A day I will forever remember! I was talking my dad ,Dan M. Rasco, yesterday evening, and he told me he was present working at the base the day this happened. He said it knocked him off his feet. – Barbara Rasco James Aug. 8, 2017.